INTRODUCTION: A sterile product is one that is free from all living organisms, whether in a vegetative or spore state. This is an absolute condition, something cannot be partially or nearly sterile, the presence of a single viable organism represents a failure of the product, and the systems (environment, equipment, and procedures as well as operators) used to produce it. Asepsis, that state in which all aseptically filled sterile products are manufactured, cannot be established as “sterile.” Aseptic processing is the most demanding of manufacturing processes. It requires precise attention to operator training and behavior, process validation, production process documentation, plant and equipment maintenance and change control management 1. Sterile Products may be broadly classified into two main categories, according to the manner in which they are produced: those which are sterilized after the product has been filled and sealed in the final container(s) ("terminally sterilized" products) and those where the sterilization stage (or stages) takes place before the bulk product is filled. In this latter instance, all subsequent processing (typically, the filling and sealing operations) must be conducted aseptically in order to prevent recontamination of the sterilized product. It is recognized that aseptic processes play an important role in rendering sterile formulations which cannot be terminally sterilized. However, terminal sterilization, in particular using moist heat processes, is considered to be the method of choice in the manufacture of sterile products due to the enhanced sterility assurance which it affords. 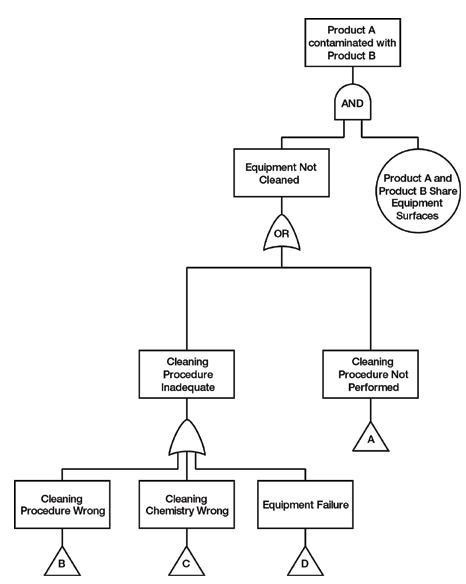 Manufacturers who choose to manufacture a sterile product without terminal sterilization must be prepared to justify this decision by demonstrating that the product cannot be terminally sterilized, even under less severe autoclave cycles tailored to the bioburden of the batch (Probability of Survival approach). The two most common pharmaceutical applications of aseptic processing methods are (a) the filling of liquid products following sterilization by filtration and (b) the filling of previously sterilized bulk powder products 2. Aseptic Processing in Pharmaceutical Companies: Aseptic processing is the most demanding of pharmaceutical manufacturing processes. It requires precise attention to operator training and behavior, process validation, production process documentation, plant and equipment maintenance and change control management. Regulators will endeavor to ensure that the safety of the health care consumer is never compromised. Aseptic processing attracts a high level of regulatory scrutiny due to the risks associated with this type of manufacturing and its potential adverse effect on the health care consumer. Contamination of an aseptic process can have a serious impact on a company’s financial viability, manufacturing license and industry reputation. Regulatory GMP codes for the aseptic manufacture of human and veterinary products mandate that an incidence involving product sterility failure or media fill contamination is fully investigated and also that the manufacturer establishes an environmental monitoring program that is properly validated to ensure that environmental contaminates are detected. 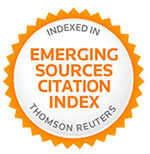 Environmental monitoring results and trends All environmental monitoring results and trends from the process are systematically reviewed to establish the presence of or increasing levels of bioburden. Environmental cleaning Environmental cleaning documentation is reviewed to ensure conformance to procedures. 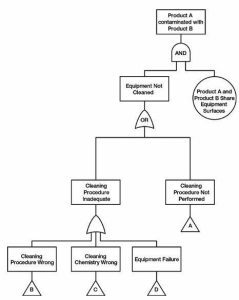 Operator behavior Operators are observed and appraised for conformance to “correct” clean room behavioral standards. HVAC operations The operational data from the HVAC is analyzed to ensure conformance to validated limits. Sterilization processes The operational data from autoclaves, hot air sterilizers, ethylene oxide and gamma irradiation etc are reviewed to ensure conformance with validated limits. Process deviations/observations The batch/lot manufacturing records are reviewed for the documentation of process deviations/observations. Process validation The Process Validation procedures and results are examined to determine whether the process was carried out within validated limits. Test Methods Quality Control product sterility and microbial test methods are investigated to ensure they were performed correctly and are appropriately validated. Change Control An investigation is carried out to establish whether approved or non approved changes were introduced into the process and if so, what impact the change may have had on the aseptic process 3. Risk Management for Aseptic Processing: Aseptic processes are some of the most difficult processes to conduct in the pharmaceutical industry. Because of the nature of aseptic processes, sterile products produced aseptically present a significantly higher risk to the patient than terminally sterilized products. Because of the high level of risk, an effective quality-risk-management program is necessary to protect the patient. An effective risk-management program aids in the careful control of the process, reducing the risk of contamination as well as wasted effort in controlling insignificant risks. Aseptic Process: Aseptic processing involves manipulation of sterile components in a carefully controlled environment using careful techniques to produce a sterile product. While aseptic processing usually involves filling of final drug product, there are other types of aseptic processes, including aseptic assembly of devices or combination products, aseptic crystallization or aseptic precipitation of drug product to produce a sterile bulk-drug substance, and aseptic formulation of final drug product. One thing all aseptic processes have in common is their high level of risk. They require careful control of the aseptic environment, of personnel practices and procedures, sterilization of equipment and components, extensive environmental monitoring, and many other controls. 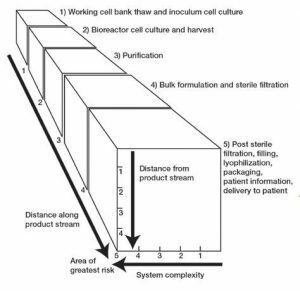 The number of controls required and the severe consequences of control failure make aseptic processing one of the highest-risk pharmaceutical processes. Quality risk management is an essential tool in ensuring product quality. The evaluation of risk to quality should be based on scientific knowledge and ultimately link to the protection of the patient. These principles lead to a need for a formal risk-management program for manufacturers of parenteral products. Because these products, which include most biotechnology-derived drugs, bypass many of the body's defense systems, the level of risk to the patient is significantly higher than in oral or topical products. Although quality risk management (QRM) is a relatively new concept to the pharmaceutical industry, it has been used in other industries for many decades, with some risk-assessment tools dating back to the World-War-II era. Equipment and Facility Design: QRM tools such as 3-D risk assessment can be used to identify high-risk equipment and facilities, as well as low-risk equipment and facilities; this will allow risk-control efforts to focus on eliminating the highest risks 6. Design of high-risk equipment and facilities can be enhanced using input from tools such as failure mode and effects analysis (FMEA) and fault tree analysis to identify potential failure modes. This input allows the equipment designer to add preventive measures to the equipment design to reduce the occurrence of, or even eliminate, potential failure modes. Equipment and Facility Qualification: QRM tools can be used to identify the critical aspects of the aseptic processing equipment or facility that need to be intensively qualified, and the low-risk aspects of the equipment or facility. QRM tools can also be used to determine the extent and frequency of requalification efforts. Change Control: QRM tools can be used to identify high-risk equipment and facilities that need to be maintained under strict change control, as well as the equipment and facilities that can be placed under a simpler engineering change management program. Process Validation: QRM tools can be used to identify the key inputs, key process parameters, and key outputs that need to be monitored and controlled. This allows for focused process validation that ensures that process parameters that are critical to product quality are appropriately validated. Risk assessments should be performed by a team of qualified experts from disciplines such as engineering, quality assurance, validation, and manufacturing, preferably facilitated by someone familiar with the risk assessment process. This team should clearly define the risk question. A poorly defined risk question can lead to lack of focus in the risk assessment. Three fundamental questions should be answered in the risk assessment: What can go wrong, how likely it to go is wrong and how severe are the consequences. Comparison of the identified and analyzed risk against pre-determined criteria (risk evaluation). Risk Control: Risk control consists of developing a plan to reduce and/or accept risks. The purpose of risk control is to reduce risk to an acceptable level. The formality and effort of risk control should be appropriate for the level of risk. The following questions should be asked during this phase: a) Is the risk level acceptable? , b) What can we do to reduce or eliminate risks? c) What is the right balance between risks, benefits, and resources?, d)Do the risk control efforts introduce new risks? A risk control plan may be the output of the risk control process. This plan may be included in a project plan or validation master plan, as part of the risk-communication process. Risk Communication: Risk communication is simply that the communication of risks between decision makers and other interested parties, either within or outside the company. This may be done formally or informally, as appropriate for the risk level of the product and process. Risk Review: Risk review is simply periodic review of risks as part of the ongoing quality management process. Examples of where formal or informal risk review might be performed include periodic management review, as part of a change control program or as part of annual product reviews. 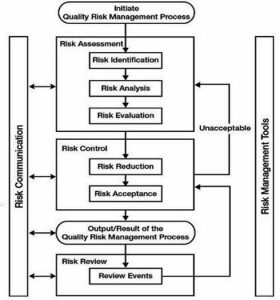 However it is performed, risk review should be integrated into the quality-management system. 3-D risk Assessment: Three-dimensional (3-D) risk assessment is a risk assessment tool that takes into account a system's distance from the process stream, its location along the process stream (e.g., active pharmaceutical ingredient [API] synthesis, and purification, bulk product formulation, sterile filtration, filling and stoppering, etc. ), and the system's complexity 6. This tool is mainly used to assign a risk level to an overall system. Where appropriate, additional risk assessment tools may be used to evaluate risks within a pharmaceutical system. Failure mode and effects analysis (FMEA): Failure mode and effects analysis (FMEA) is one of the most commonly used methods for pharmaceutical risk assessment. It is a team-based structured risk assessment method that can assign a numerical risk priority number based on relative perceived risk. A FMEA is dependent on the expertise of the team members. Develop control strategies for the identified hazards. Implications of Risk Assessment on Processing: When a process step or other activity is determined to be high risk, these determinations should cause initiation of project activities to reduce the risk level. However, if reduction is not possible, there should be additional in-process controls, additional testing, additional training, and so on. In summary, the organization should expend additional effort to mitigate or control the risk situation. At the same time, efforts on processes or activities that are well controlled or do not represent risk can be minimized. Risk analysis tools can be used to screen potential variables for DOE studies to minimize the total number of experiments conducted while maximizing knowledge gained. Qualification of utilities and equipment can be covered under individual plans or as part of an overall project plan. The plan should consider the requirements of use and can incorporate risk management to prioritize certain activities and to identify a level of effort in both the performance and documentation of qualification activities 9. "Significant changes to the facilities, the equipment, and the processes, which may affect the quality of the product, should be validated. A risk assessment approach should be used to determine the scope and extent of validation" 10. 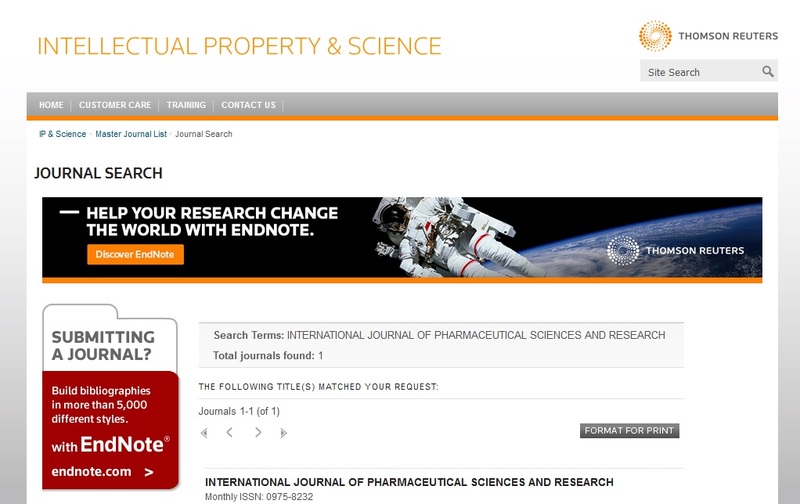 Risk- Assessment Tools: Risk-assessment tools are used to determine the extent of validation and frequency of validation. Low Risk System: A chilled water system was used to cool a jacketed tank during formulation of a product prior to sterile filtration. This system contacts the tank jacket only. The chilled water system was controlled by an off-the-shelf temperature control system with a chart recorder. The chilled water system is low risk system because no qualification was necessary beyond engineering commissioning of the system. Once commissioned, the system was placed under a standard PM program, and the chart recorder and temperature controller were calibrated on an annual basis. Medium Risk System: A bulk formulation tank was used to compound a parenteral product before sterile filtration. This tank was connected to a distributed control system (DCS) that controls mixing speed and temperature according to set points entered by the operator from a local panel in the compounding area. Ingredients other than WFI were added manually by the operators. WFI was added from a WFI drop at the mixing tank, which was opened by the operator from the DCS local panel. A level transmitter connected to the tank indicates the volume of WFI added to the tank. Based on the risk score of 60, the system was designated as a medium-risk system. Construction and operation of the formulation tank were verified under installation qualification (IQ) and operational qualification (OQ) protocols. The compounding process itself was verified under a performance qualification (PQ) protocol. After completing IQ, OQ, and PQ, the formulation tank was placed under change control. No periodic requalification was required, but periodic assessment of the system was required to ensure it maintained its validated state of control. Based on the risk score of 125, the lyophilizer was designated a high-risk system. Extensive validation efforts, including computerized system validation (CSV), CIP, and SIP validation, IQ and OQ including shelf mapping, condenser capacity and sublimation rate, and other tests were performed to characterize the performance of the lyophilizer. PQ of the lyophilizer included surrogate lots with site-specific sampling for moisture content, cake appearance and reconstitution, followed by media fills and conformance lots for the protein therapeutic. The lyophilizer was placed under change control with periodic requalification, including shelf mapping and requalification of the CIP and SIP processes. Media fills were performed using the lyophilizer on a quarterly basis. CONCLUSION: Quality risk management is one of the most important tools for qualification of aseptic processes. It is not just a tool for CGMP compliance; it offers real benefits to the validation process by identifying risks and ensuring that critical risks are controlled. By focusing managing risks to the patient, pharmaceutical manufacturers can ensure that the right resources are applied at the right place at the right time improving patient safety while eliminating unnecessary validation efforts.